Every family has to do what's best for them, of course, but with research that shows us that simply sharing a room together can help reduce the risk of SIDS, it's definitely worth exploring if you can make room sharing with your baby work for your family. If you are expecting a baby or have recently welcomed a little one into your home, here are some tips for room sharing. Although the AAP says that the ideal situation is keeping the baby in your room for an entire year, they especially emphasize the importance of the first six months because that's when the risk of SIDS is higher. 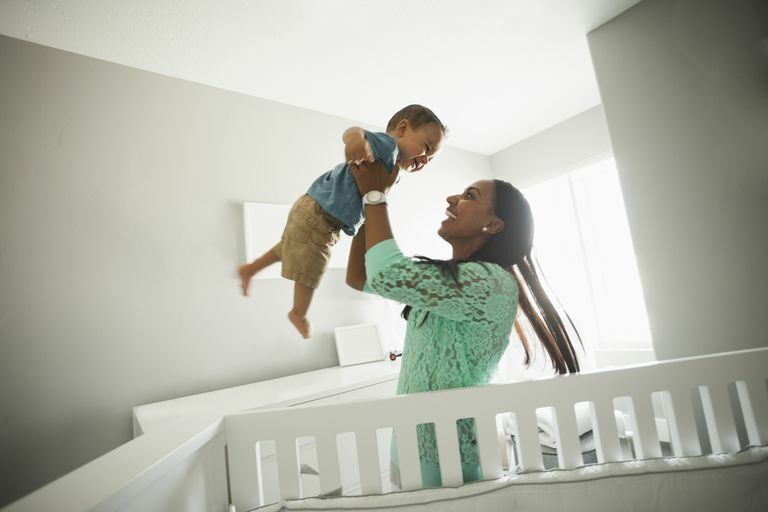 If your family situation prevents you from being able to share a room with your baby for a whole year, you could instead focus on keeping the baby in your room for the first six months of his or her life. The most important thing to keep in mind about sharing a room with your baby is that the reason it reduces the risk of SIDS is that the infant is within view of the parents or caregivers more frequently. So the APP recommends that you put the baby's crib or sleeping environment in view of wherever you sleep so you can clearly see your baby and reach him or her quickly to feed and soothe him/her. In other words, room sharing isn't going to make much of a difference if you place the baby's crib in a corner or closet where you can't see him or her—the point is to keep the baby close. Here's a secret tip: white noise. You can use a fan for white noise in your house, but there are different types of soothing white noise machines you can buy and even use with you when you travel. Fans work for two purposes: they drown out other noise, such as getting ready for bed or siblings running around upstairs, and they are a "sleep signal" to little ones. They know once the fan is on, it's time to sleep. And as a bonus, the use of a fan in a baby's room is associated with lowering the risk of SIDS as well, so it's a win-win. The AAP's recommendations also included a special section on multiples. The experts recommend that if you have twins or multiples, you should always put them to sleep separately, not in the same sleeping environment. There isn't enough evidence at this time to say that sleeping together is safe, so they instead recommend separate cribs or playpens. Obviously, when you're sharing a room with your baby, there will be less room for all of the baby's stuff. So you'll have to consider what you need close by and what can remain in the baby's bedroom. You may find that keeping a basket of diapers, wipes, and easy changes of clothes for those inevitable blow-outs in the middle of the night is sufficient.